In July I attended Cork Meeting in Ireland. The ministry, as I recall, was mainly concerned with Irishness and Quakers' attitude to it. The meeting house is at 51.8920°N 8.4686°W, 23 Summerhill South in the south suburbs of Cork City. 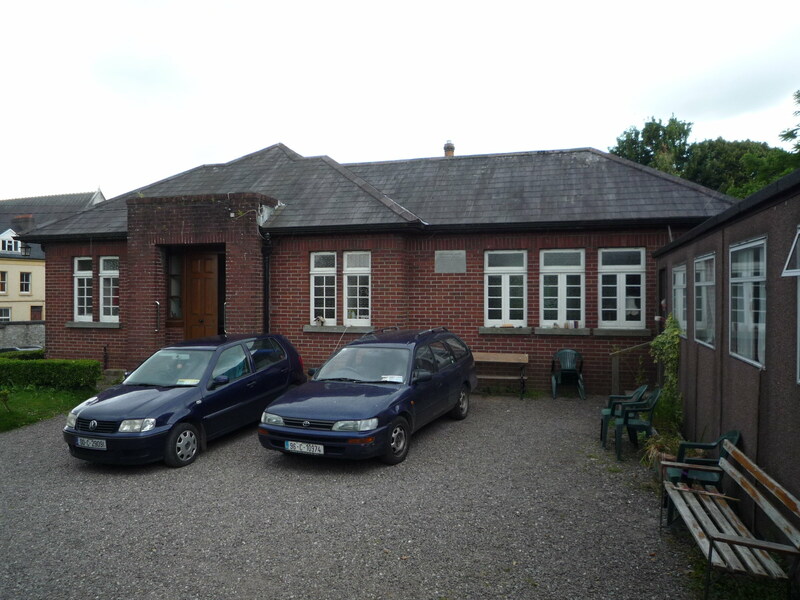 A plaque on the wall reads: this meeting house was built in 1938 on leaving our premises in Grattan Street which Friends occupied from 1677 to 1938. Considering that it was purpose built, its layout is rather strange, being long and narrow more reminiscent of the Commons Chamber than a Quaker meeting room. The main building contains toilets and a library. A more recent building, on the right in the photo, is used for coffee after meeting and as a kindergarten during the week. A well populated graveyard behind the meeting house suggests that Friends had owned this plot as a graveyard from well before 1938. More photos. The old meeting house at 17 Grattan Street in Cork city centre appears to be still standing at 51.8995°N 8.4799°W. It is a curious tall narrow building called Duncan House with a newer block called Quaker House behind matching it in shape. An apartment there is going to cost you about €800 a month to rent. This page claims that the old meeting house is "where William Penn embraced the creed before going off to the new world to found Pennsylvania". (Clearly written by a non-Quaker - "embrace the creed" - what creed?!) Grattan Street is presumably named after Henry Grattan who tried to get Ireland its own parliament. Via Tony Barlow of Sutton Meeting, I discovered a fascinating document which includes details of events in Cork in 1920. The full document has the catchy title of Evidence on Conditions in Ireland: Comprising the Complete Testimony, Affidavits and Exhibits Presented Before the American Commission on Conditions in Ireland and runs to a thousand pages of harrowing stories about Ireland at that time. Among them, and notable for its restrained tone is the report by John Henry Barlow, Tony Barlow's grandfather of a visit that John Henry and two other English Quakers made to Ireland in 1920 Sept. The report also contains extensive evidence from the family of Terence MacSwiney, Lord Mayor of Cork whose death on hunger strike in Brixton Prison is remembered in this somewhat maudlin song. In North Street, Skibbereen I found this splendid Victorian pillar box. 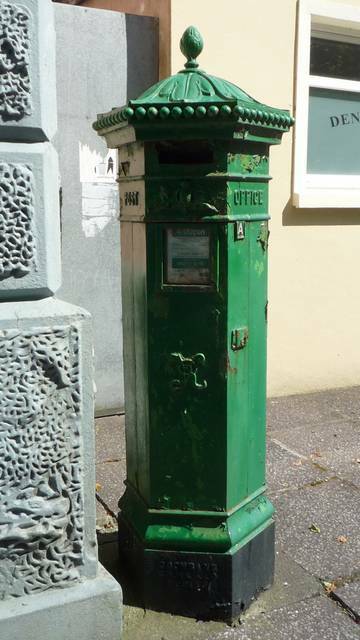 It struck me as a tangible link to the past - people may have been posting letters in this very box to others who had left old Skibbereen because of the famine (1845-52). The unmistakeable gravelly tones of Ronnie Drew singing about it. When Ireland got her freedom, the forerunners of An Post saw no reason to throw away this useful bit of English hardware. They simply painted it green and, as Cathy Spence pointed out, declared that VR now stood for "very republican". More photos.